Unless this is for the short term and there is a good temporary reason for it, keeping cats restrained on a short leash all day is an abuse. It reminds me of dogs being kept in the same way which is also cruel. This cat owner appears to live in a block of flats in Singapore. He or she has two cats (I will refer to the person as “he”). 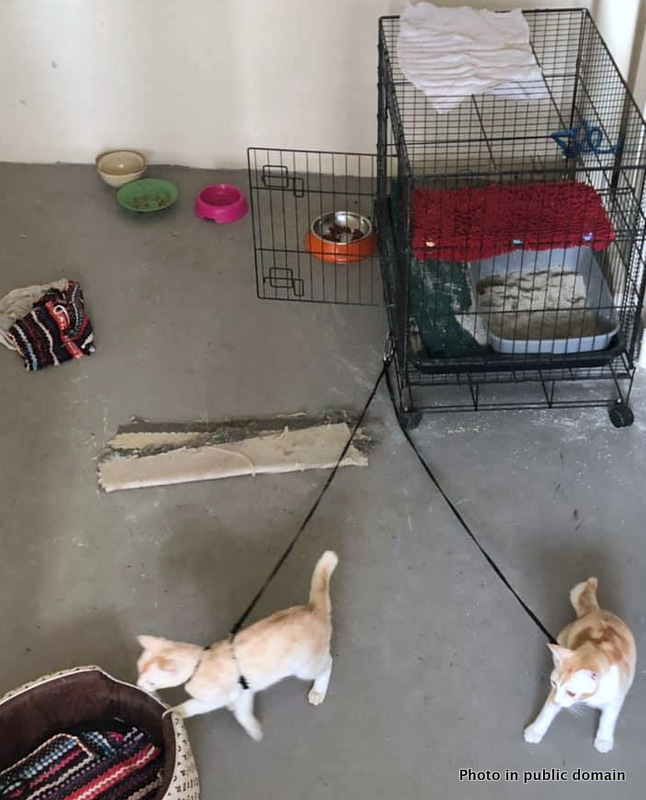 He appears to be out working all day and he keeps his cats leashed to a cat cage all day (see photos). He provides them with food and water and a bed which is just out of range. There is a litter tray inside the cat cage which is open. All the paraphernalia of this arrangement appears to be in what I would call the common parts of a condominium. What I mean is the cats are kept on the landing of a stairwell. It appears that this landing is just below the level of his flat. That’s the story and it’s an appalling one. 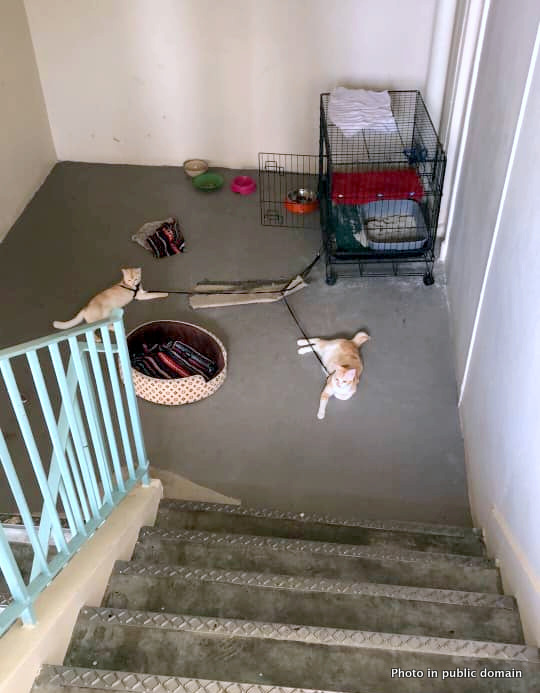 I have stated that this is happening in Singapore because the information comes from a Facebook page, “Lost and Found Pets-Dog Cat Lovers Singapore“. The person who posted the story on Facebook asks whether this type of human behaviour is allowed in Singapore. I think that that’s a good question. Singapore has animal welfare laws. On the face of it, it’s animal cruelty. It is certainly animal abuse. Although the owner, whoever he is, will say that he feeds his cats and waters them and so on and so forth and therefore it can’t be an abuse of the animals. But of course he’d be incorrect. The cats are prevented from expressing natural behaviour. This automatically causes a degree of emotional suffering which in turn means that it is animal cruelty under almost all animal welfare laws. There are worse forms of animal cruelty but that does not excuse this behavior. There’s no doubt in my mind that the person is ill-equipped to look after domestic cats. His attitude is entirely incorrect. His approach to cat ownership is misguided. Note: As mentioned this may be a temporary arrangement. If it is for a short period it may be just about acceptable if he has no other solution. This possibility needs to be mentioned. The general mood amongst visitors to the page who have commented is that this treatment of domestic cats should not be allowed and it should be stopped as soon as possible. They recommend reporting the owner to the SPCA. Some people think it’s very cruel. It also begs the question as to what the neighbours think about it. What he’s doing affects his neighbours in a direct way. Why aren’t they talking to him about it or reporting the matter to the SPCA or some other government body? Of course, you don’t want the cats to be euthanised because they have become unowned but you also have to take action under the circumstances. It’s the first time that I have seen this sort of cat ownership behaviour. It reminds me of wild birds kept in cages and monkeys kept on short leads all their lives. It makes monkeys mad eventually. It simply has to stop. It is a human weakness and self-indulgence. Ever felt like hiting a man who killed a cat? This guy did. This entry was posted in animal abuse and tagged animal law, animal welfare, animal welfare laws, cat abuse, singapore by Michael Broad. Bookmark the permalink. Yes, it has probably been going on with the consent of the neighbours for a while which indicates a problematic attitude to cat ownership in that neck of the woods.